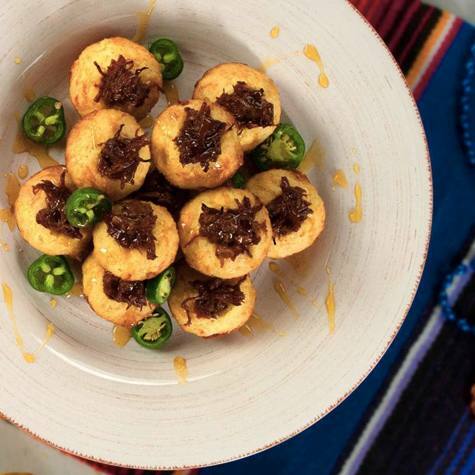 The jalapenos on the bottom pair perfectly with BBQ pork stuffed in a tangy, hot corn muffin mix. The drizzle sizzles, too. Grease a 24-cup mini muffin tin with cooking spray. In a medium bowl whisk together the muffin mix and Colman’s Dry Mustard Powder. Stir in the milk and egg just until combined. Fold in the shredded cheese. In a small bowl stir together the barbecue sauce, chipotle, and 1 teaspoon Colman’s English Mustard until combined. Stir in the pork until fully coated. Place 1 jalapeno slice into the bottom of 22 mini muffin cups. Top with 1 tablespoon of the corn muffin mixture. Make small wells into the centre of each muffin and fill with heaping teaspoonful of the pork mixture. Bake on the centre rack for 9-11 minutes or until edges are golden and a toothpick inserted into the muffins comes out clean. Let cool for 5 minutes, then gently run a knife around edges. Colman’s Prepared Mustard, and adobo sauce. Drizzle over muffins.